What a whirlwind few days this has been, installing FAB Docks in Brisbane, Townsville, Darwin and Perth. We even had to get Sharon out of the office to help us install David’s FAB Dock under his very well appointed Voyager Cat. A magnificent cruising powercat that David and Javana do just that. With frequent trips to the Sunshine Coast, Fraser Coast and the Keppel Island Group from their base north of Brisbane, they certainly make the most of their boat. 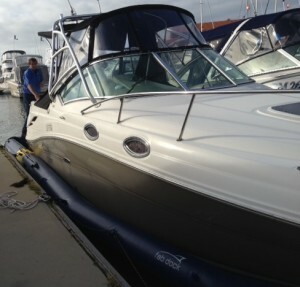 Then it was off to Townsville to install a FAB Dock under yet another Caribbean. 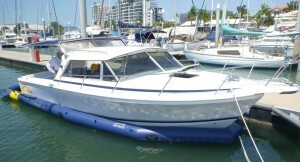 Adrian had just picked himself up an absolute bargain on the Gold Coast and had it trucked up to Townsville. The boat is in absolute pristine condition and hadn’t even been spoilt with antifoul. So the timing was perfect as we had the FAB Dock in place the night before the boat arrived and Adrian drove his brand new pride and joy straight from the boat lift into his FAB Dock first thing on Saturday morning. In the meantime, Guy was busy installing another FAB Dock in Hillarys Harbour in Perth under Peter and Mal’s 27 Sea Ray Amberjack. I am looking forward to seeing it for myself in a couple of weeks when I am next out there. 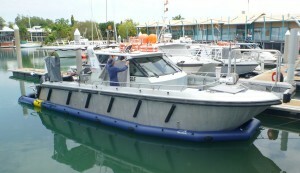 For me, it was then off to Darwin in install a FAB Dock under one of Rick’s commercial dive boats (see previous story). And tomorrow it is off to Auckland to officially launch FAB Dock into the NZ market so watch out for the wrap up of the Auckland boat show.